Following your dentist’s advice can keep you looking young! There’s something you can do to help your face keep its youthful appearance that’s very simple, takes only a couple minutes, is cheap and you can do it (almost) anywhere. Know what it is? Everyone’s gums recede as they grow older. And surprisingly this seemingly subtle change does quite a bit to age your facial appearance. So, not only does flossing remove harmful bacteria, prevent gum disease and support your overall good health – it will also keep you looking more youthful. We’re willing to bet that if preventing a receding hairline was as easy as just combing your hair – you’d do it! Well, you can help to prevent a receding gum line by flossing your teeth daily. While that very annoying popcorn hull after an evening at the movie theatre can be a great motivator to get the dental floss out when you get home, don’t let the feeling of lodged food be your only inspiration to floss. Flossing isn’t just about removing food particles. 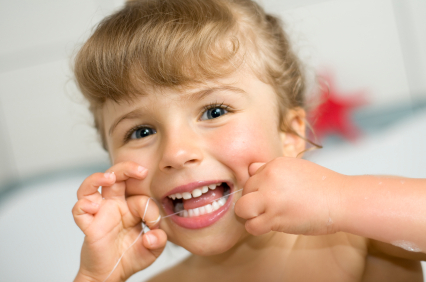 Flossing removes dental plaque – a bacterial ecosystem that collects on your teeth. Dental plaque (by the way, isn’t it interesting how much the word plaque looks like the word plague? Plaque is a kind of plague for teeth!) It’s what causes inflamed gums (gingivitis), tooth decay, periodontal disease and if left to do its destruction, tooth loss. Along with flossing every day, come in and see us at Dakota Dental family dentistry for your routine dental cleaning. This professional dental service is vital for your gum and dental health. We’ll very gently remove the microbes from your gum tissue to keep your gums healthy and help prevent them from receding. And if you’ve ever thought about cosmetic dentistry – changing the color, shape, position or size of your teeth, we can help answer those questions as well. Our Apple Valley dentist, Dr. Wakefield, is uniquely certified in aesthetic dentistry. How did the old saying, “Don’t look a gift horse in the mouth” originate?